Cashews are a member of the same family as poison ivy, Anacardiaceae. Like poison ivy and many other members of the family, part of the cashew plant contains an oily chemical called urushiol, which is a strong irritant for most people and can even be fatal for some if ingested. 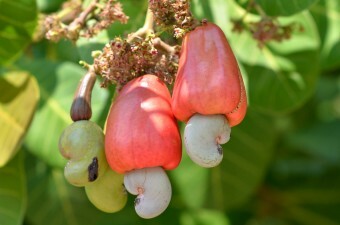 In cashews, the urushiol is found not only in the leaves, but also in a layer of oil between the shell and the cashew seed. Needless to say, shelling cashews is something that needs to be done very carefully and not by consumers. Despite the need for care in shelling cashews, it’s still often done by hand, much to the chagrin of the workers involved, particularly in poorer nations where safety equipment is often lacking. From the above, you might be wondering why you can purchase raw cashews. It turns out, even so-called “raw” cashews are not actually raw. Eating true raw, unprocessed cashew seeds would result in you ingesting some of this urushiol, which, as mentioned, can potentially be fatal. Thus, the seeds must either be roasted at high temperatures to destroy the offending oil or, in the case of “raw” cashews, usually steamed and/or boiled in oils. Historically, most pistachios in the United States were imported from the Middle East. The problem was that when they arrived, they tended to have numerous blemishes on the shells, particularly stains left over from the harvesting methods employed in the Middle East. These stains weren’t good for marketing purposes. To get around this, importers devised an idea to not only mask the blemishes, but also to help draw the eye to the pistachios, namely, dying them red. This all began to change in the 1970s when pistachios started to be grown in the U.S. commercially. Today, the vast majority (upwards of 98%) of pistachios sold in the United States are grown and processed in California with much better harvesting and processing facilities than decades before in the Middle East. These improved facilities result in fewer blemishes and stains appearing on the pistachios, so there is less need to dye them, which is one of the reasons the practice is dying out. Unlike many seeds, the cashew seed grows on the outside of the fruit itself as you can see from the above picture, making it a “false fruit” or “accessory fruit.” The fruit, known as a cashew apple, is actually very good to eat, but is not widely consumed outside of areas it is grown in due to the fact that it’s not easy to transport because of its extremely fragile skin. Like the cashew, pistachios are a member of the Anacardiaceae family, meaning they, too, naturally contain the chemical urushiol that makes poison ivy and others in the family so irritating. In the pistachio’s case, the primary concentration of urushiol is in the pistachio itself. 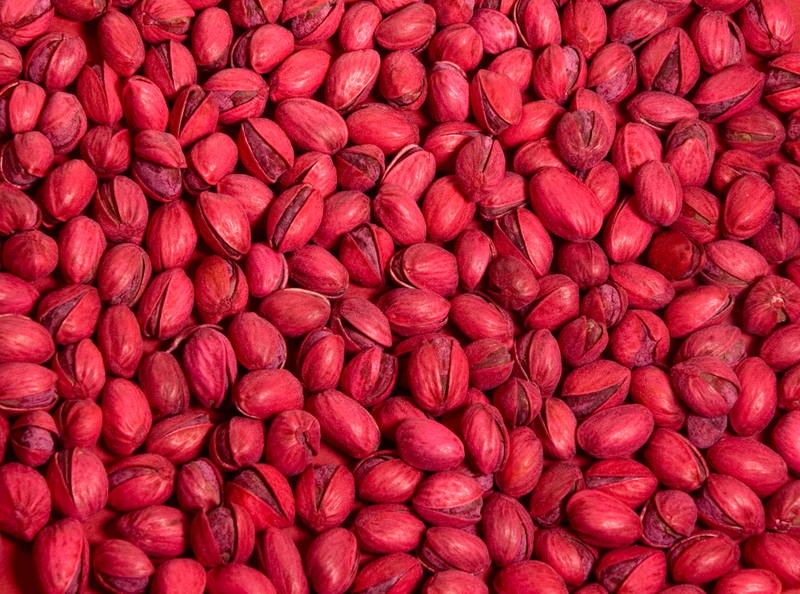 I believe that red pistachios fell out of favor in this country when Iranians took the American embassy officials hostage. 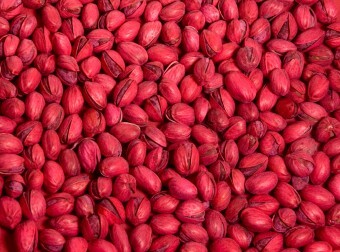 Red pistachios were a symbol for Iran and people refused to buy them buying the undyed California pistachios instead. I live in Brasil and cashew juice is very common. It kind of has a citrus and nutty flavor combination going on. But it’s really good and high in Vitamin-C. The question I really want to know – why are pistachios ALWAYS sold in their shells? Why can’t I buy a jar of them already shelled, like I can other nuts? Unshelled pistachio’s are available in many stores, including Trader Joe’s and Costco here in California. Also online at places like nuts.com. Manufacturers often add too much salt to them for my taste. I have not come across any unsalted, shell-less pistachio nuts. In any case, I rarely eat pistachio nuts as they are very expensive on a per pound basis when you consider that you are throwing away the shell. One pound unshelled typically runs about $18-20/lb. I have seen them sold already shelled, but they were very expensive..
Not that common, but I’ve seen them around. Quite pricey! VERY INFORMATIVE. HAD NO IDEA BOUT THIS. TNX. …he primary concentration of urushiol is in the pistachio itself….THEN HOW DO THEY MAKE IT EDIBLE? OR IS THAT ROASTING IN THIS CASE TOO IS SUFFICIENT TO DETOXIFY THE NUT.? Bob, if memory serves me correctly, we embargoed Iranian pistachios after they seized our embassy. Great article. Thanks. I used to love nuts. Now though it seems the nuts I buy (Cashews, Pistachios, Mixed nuts) all seem a lot dryer then they used to be. Are they being irradiated? Or is some of the oil being siphoned off to sell separately? I remember a story from a long time ago explaining that the pistachios were dyed to mask the blemishes and holes left by the bugs that fed on them… I wonder if the “bug” part of that story was true?